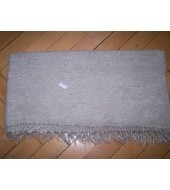 Handwoven wool cloth in off white colour -plain weave. Weight is 275 grams per meter and width is 124 cm. Price is per meter. Weft made from sheep hand spun wool thread !